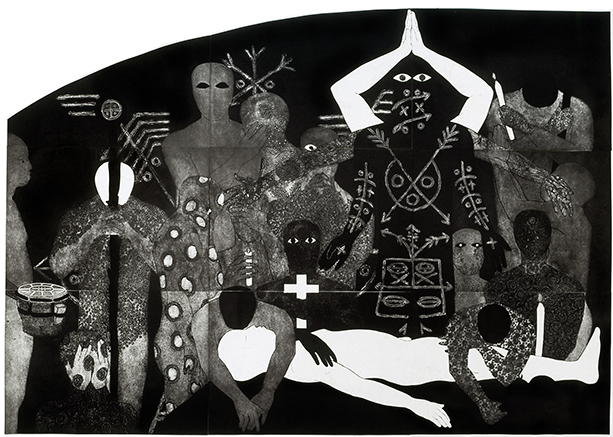 In her retrospective, Nkame, at the Kemper Museum of Contemporary Art, Belkis Ayón offers a feminist perspective on an Abaku mythology, myths that have been generated from a male-dominated society in Socialist Cuba. A closer read of this work suggests the benefits and repercussions of social tribalism, while also offering a bleak look at the extreme gendering present within the Cuban culture. Cuba continues to deal with issues surrounding gendering, despite the Cuban constitution declaring that men and women possess equal rights. Strict censorship laws make it difficult for members of the society to express their opinions on the state of the government and its’ ongoing power struggles. Historically, women were not typically found in positions of power and faced discrimination by the job market. The transgender community in Cuba has made significant strides, as the government has made it legal to undergo surgeries, but most transgender persons find themselves being discriminated within the workforce. For trans and femme identifying folks in general, discrimination is a commonality. In relationship to the myths of the Abakua, Ayón was primarily feeling exiled in the presence of the Abakua due to differences in physiques that she could never conform to. Distinction in gendering existed within these myths, and this was recognized by Ayón. Within this work, she rewrites the myth, putting women in control. Several small scale prints that greet the viewer at the entrance of Nkame revolve around the myths of the Abakua, a secret society composed of men that originated in Nigeria and moved through Cuba in the 19th century. These myths — men shifting into leopards, secret exchanges and Sikán — reveal hidden truths about the Abakua, in which Ayón was trying to make sense of the missing piece; the female presence in the puzzle of the all-male Abakua. In each, she is acting as a female messenger for their narrative, and contributing to the exposure of a group who wants anything but to be in the limelight. This mix of small and large scale collagraphs use grayscale, texture, and contrasting tonal values to define the figures present within the work. While the presence and shape of the eyes belonging to each figure vary, they all lack a mouth, silencing them as they exist among the other figures in the same way that the Cuban government has tried to filter what comes out of their country under their brand of socialism. This creates a false sense of reality for the citizens of Cuba, and the idea of a myth as a fiction, rather than a system of beliefs, lingers throughout Ayón’s prints. She expresses her idea of the “other” within this work through use of of the stark white figure as the outsider. Within the larger compositions, the white figure is seen woven into the work, with the absence of value being the only discrepancy. The color white has been historically viewed as a color representing purity; however, the way Ayón is using it conveys the opposite effects, using white as a sign of absence and death while attributing it to the female figures. While she says she adopts the position of Sikan within the expression of the Abakua myths, she is also taking a notable stance as a female leader. This is something that was rare to find within the Cuban culture unless it passed through the censoring process as “art,” rather than straight political propaganda conflicting with the beliefs of the regime. 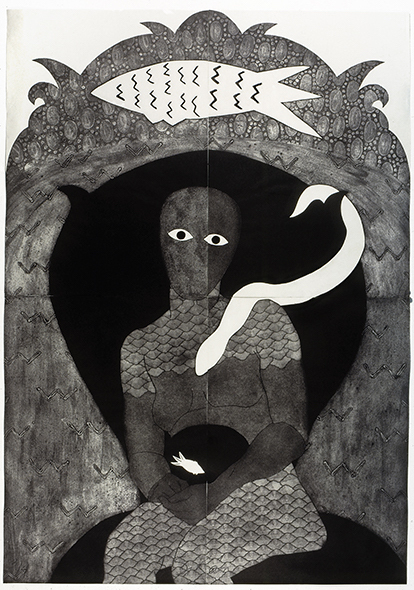 In many of these works, Ayón uses the snake as a symbol of feminine power. 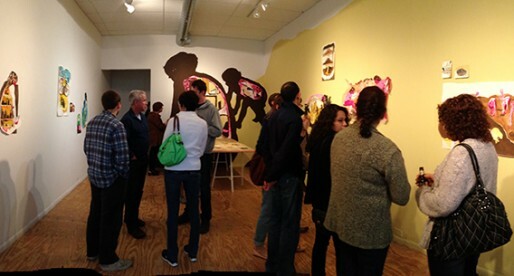 The snake becomes the “other” in many of these works, as the displacement can be felt within the varying compositions through the use of the animal and snake patterning found on the female figures. The scale of the larger prints brought me into an environment created by Ayón, making me feel included in the Abakua, ready to absorb symbols and suspend my own beliefs for a walk through their mythology.. While experiencing the show, the smaller prints pushed the idea further and instead of acting to break up the heavy weighted subject matter, it brought me deeper into the mindset of Ayón observing the secrecy within these groups, which was only disrupted by exiting the space. Ayón’s technique and precision within these compositions should not be discredited, as the prints’ contrast calls you in while pushing you out. Her technical proficiency with collography kept my eyesight constantly shifting between different visual planes, adding to the works’ complexity. The flattened figures and rich blacks keep the composition overt, while the various added textures and patterns bring me back to the rich complexity of what lies behind the aesthetics. 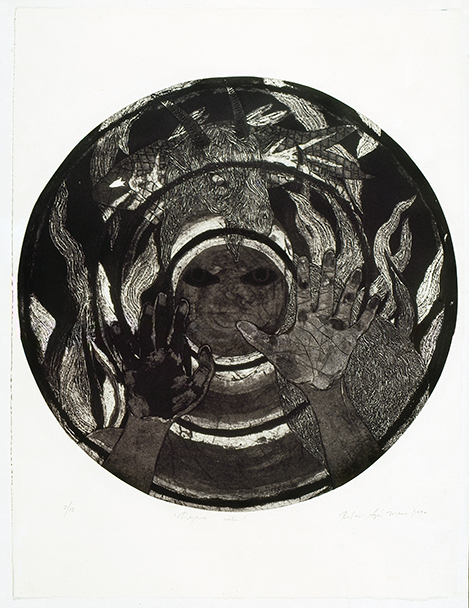 Nkame: A Retrospective of Cuban Printmaker Belkis Ayón (1967–1999) is currently on view from Thursday, January 25, 2018 to Sunday, April 29, 2018 at the Kemper Museum of Contemporary Art. Eugene Richards: The Run-On of Time: Too Rough for a Museum? Rebecca Swanson is an artist and art writer based in Kansas City, Missouri. She is currently studying Photography and Art History at the Kansas City Art Institute and her writing is non-fiction focused through a photographic lens. She is currently a Staff Writer for Informality.